Cyclists will travel out of their way to use separated bike routes—and will reduce their chances of injury by doing so—according to two new studies. Portland State University researchers attached GPS units to 164 bicyclists for several days each in a study published on-line by Transportation Research Part A: Policy and Practice. Routes were then plotted on Portland’s overall bicycle network, to determine those cyclists’ route preferences for utilitarian trips. The study weights types of facilities against distance, to create a matrix of trade-offs on route preference. Sure, a separated trail is nicer, but how much more distance will a bicyclist travel to use one? 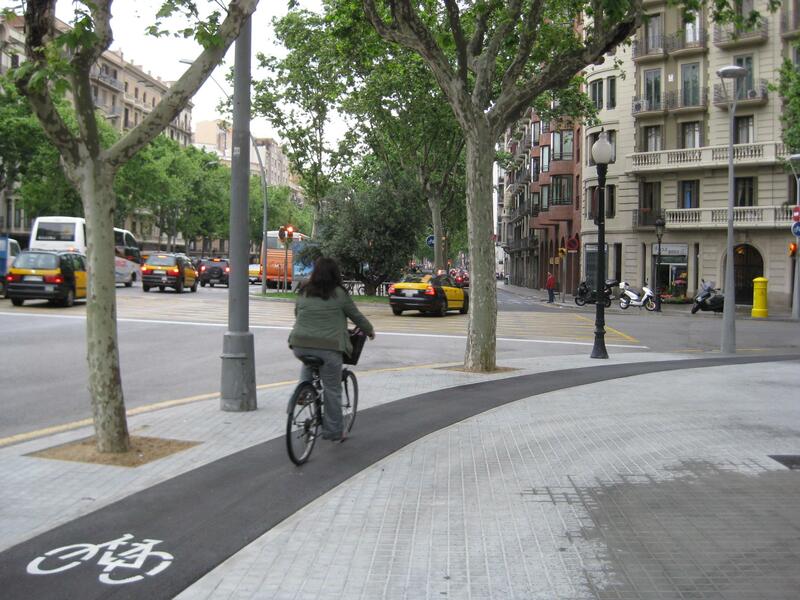 The study found that separated bike paths are equivalent to reducing trip distance by 26 percent, while bicycle boulevards (studied here for the first time) equate to a trip distance reduction of 17.9 percent. Cyclists are willing to detour 16.2 percent of their trip distance to avoid a left turn at an unsignalized intersection. Already these data have been incorporated into Portland’s bicycle trip planner, and into the open source system OpenTripPlanner. The other recent study, published on-line by the American Journal of Public Health, looks at safety. Researchers in Vancouver and Toronto recruited 690 local cyclists injured while biking, and compared infrastructure design at their injury sites to randomly selected control sites on those cyclists’ same trips using something called a case-crossover study. Most often used in health research, case-crossover studies consider subjects at two different points in time—as opposed to considering two different groups of people. In health research, such studies result in the classic “increased likelihood” percentages. This methodology is not typically applied to bicycling safety, but the general question is similar: how much more likely is a cyclist to be injured on, say, a cycle track versus a typical roadway? The researchers found that cycle tracks had the lowest risk of all considered facilities—about one-ninth the risk of the control: a high volume roadway with parking. Major streets were safer without parked cars (0.63 risk factor, where the control is 1.0). Bicycle lanes and local streets were about twice as safe (0.54 and 0.51 risk factors, respectively). Several factors reduced bicyclist safety: streetcars and trains tripled risk, while downhill grades and construction also were more hazardous.